What’s better than a race where you can earn some booty and shoot at your opponents? Racing, pirates, battles and doubloons. This beautifully designed game was made for the European insurance company ASSURA SA by GameWorks. The marketing department must be big boardgame fans. What’s more, they have the intelligence not to splash their company logo all over it. A tough game to get hold of initially, but definitely worth it, and as high quality as anything from industry leaders Days of Wonder (whose game, Pirate’s Cove, it calls to mind). 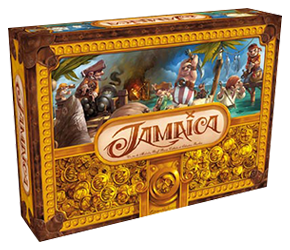 Now released by Asmodee and worth adding to your collection.